For other uses, see Gelato (disambiguation). Gelato (Italian pronunciation: [dʒeˈlaːto]) is a frozen dessert popular in Italy. It is generally a mixture of custard, cream, and milk, without eggs. Gelato is made with a base of milk and sugar. It is generally lower in fat than other styles of ice cream. Gelato typically contains less air and more flavoring than other kinds of frozen desserts, giving it a density and richness that distinguishes it from other ice creams. The Italian law requires gelato to have a minimum of 3.5% butterfat. Gelato can be served in any way that ice cream is, including cup, cone, sandwich, cake, pie, or on a stick. 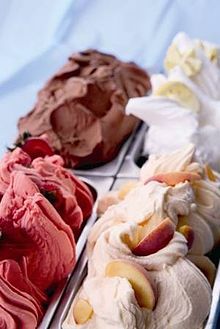 Gelato was invented by Bernardo Buontalenti, in Florence (Tuscany), during the Renaissance period. The Buontalenti created the dessert for the Grand Duke Cosimo I de' Medici, who wanted him to organize an opulent banquet to celebrate the Spanish deputation. In Florence, most shops selling hand-made ice-cream also usually offer a "Buontalenti" flavour. The Sicilian fisherman and cafe founder Francesco Procopio dei Coltelli, who lived in the late 1600s, is credited with being the inventor of modern gelato. However, the popularity of gelato among larger shares of the population only increased in the 1920s–1930s in the northern Italian city of Varese, where the first gelato cart was developed. Italy is the only country where the market share of artisanal gelato versus mass-produced gelato is over 55%. Today, more than 5,000 modern Italian ice cream parlors employ over 15,000 people. The more modern flavors consist of fruity flavors such as raspberry, mango, and pineapple. The hot process consists of heating the ingredients to 85°C (185 °F) for pasteurization. Then, it is lowered to 5°C (41°F) and mixed to the desired texture. The cold process mixes the ingredients and is batched in the freezer. In the "sprint" process milk or water is added to a package of ingredients which is then mixed and batched. As with other ice creams, the sugar in gelato prevents it from freezing solid by binding to the water and interfering with the normal formation of ice crystals. This creates smaller ice crystals and results in the smooth texture of gelato. American commercial gelati are typically sweetened with sucrose, dextrose, or inverted sugar, and include a stabilizer such as guar gum. ^ "Learn The Difference Between Gelato and Ice Cream". The Spruce Eats. ^ "Nutritious facts on gelato compared to ice cream". San Francisco Gate. Retrieved 20 August 2014. ^ Poggioli, Sylvia (17 June 2013). "Italian University Spreads The 'Gelato Gospel'". NPR. Retrieved 7 July 2016. ^ "How Gelato is Made Served and Displayed". Orion. 14 April 2017. Retrieved 3 May 2018. ^ University, Spoon. "This is the best gelato flavor in the world, according to Europeans". Business Insider. ^ "Il Buontalenti - Badiani". www.gelateriabadiani.it. ^ "Francesco Procopio dei Coltelli: the man who invented gelato". ^ See guide.supereva.it, outside of Italy the bigger number of gelaterie is located in UK, France, Germany and north Europe in general. ^ a b "Traditional Flavors | WhyGelato". whygelato.com. Retrieved 16 April 2018. ^ "How It's Made | WhyGelato". whygelato.com. Retrieved 24 April 2018. ^ Omran, A. Monem (July 1974). "Kinetics of ice crystallization in sugar solutions and fruit juices". AIChE Journal. 20 (4): 795–803. doi:10.1002/aic.690200422. Ferrari, Luciano (2005). Gelato and Gourmet Frozen Desserts - A professional learning guide. Lulu.com. ISBN 978-1-4092-8850-3. Wikimedia Commons has media related to Gelato.